Happy New Year to everyone! I hope you had a safe holiday and are somewhere warm if it’s cold and somewhere cool if it’s not. We had a great New Year’s Even show at the Parlor Room. Thanks to all longtime fans who came out and to the people who are new to the band. You can check out a clip of “Everybody Wants Me To Love You” from that show right here! Warwick Town Hall was a great time, too! 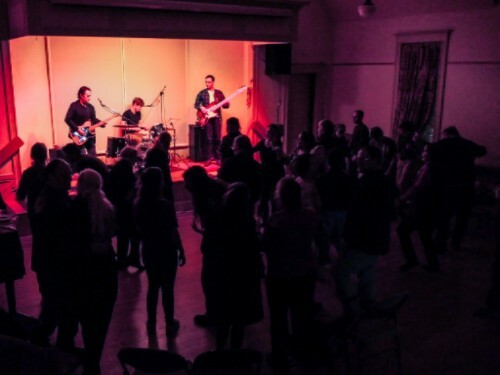 A great sounding room, top notch PA, a full house of fine dancing folk all combined to make for a fantastic night. Did I mention Beth’s Famous Kalua Mousse? Well, next time they have a Super Supper you’ll have to see for yourself. Make sure to check out their Corned Beef and Cabbage Night on Saturday, 3/18 when Shokazoba (featuring Matt and Riley on bass and drums) take the stage. Thanks to Alan Morgan for the pic. On top of all this we got the royal treatment in the offices of the Valley Advocate a couple of weeks ago and Northampton Community Television (in partnership with Signature Sounds) filmed a 25 minute set of ours in crystal clear HD with great sound and lighting. You can watch that whole shebang by clicking right here. This all leads me to our big week of shows which I hope some of you can make it to. Thursday night, 1/19 we will be making our first appearance The Middle East Corner in Cambridge, MA. The Corner is a 60 person capacity space that is as intimate as it gets. We will be playing from 10-10:45. It costs a whopping $5 and we’re happy to be opening for Somerville’s own funk rockers, The Slum Raisins. Should be a good time. The Facebook Event for that is right here. If you have friends in the Boston area and could share this with them that would be awesome. Friday, 1/19 sees me, Matt and Riley heading west again to rock out at Pauly’s Hotel in downtown Albany, NY. We had a great time at our last show there and we’re hoping this one will be even better. Facebook Event right here. This is a four band bill and we will be going on around 11pm. See the details below for the rest of the lineup. Sunday, Sunday, Sunday, 1/22. Yes, if you’re not a Patriots or Steelers fan (ugh) you might want to know about this show. If you are more of a Colorway fan than a Patriots fan then you still might want to know about this amazing show. If you don’t care about football at all then you have no excuse to not be at the Iron Horse Music Hall in Northampton when Colorway shares the stage with the one and only, Davy Knowles. Davy is a british guitar slinger who calls Chicago his home nowadays. Peter Frampton recently sang his praises by saying, “Davy already has a recognizable style. He’s definitely the gunslinger guitarist of the 21st century,’’ We’re really looking forward to this show and hope you can all make it there if you’re in the area. The show starts at 7pm sharp with a 30 minute set by Colorway. Facebook Event right over here. And lastly, to close out January we will be returning to NYC and hitting up a great corner bar famous for live music, The Sidewalk Cafe. Situated on the corner of Ave A and 6th St in the East Village this place will be overflowing with tunes on Saturday, January 28. Come see us play there at 10:15. Facebook event if you please. Well, that’s pretty much it for now. Plenty of stuff happening in February. You can see all about all our shows coming up by going right here to our shows page. I’ll have more to talk about next time around, including some details on our upcoming tour of the southeast as well as more spring shows (remember spring? It’s coming back and it’s gonna be awesome). Colorway is proud to share their short set of songs which were performed at the Valley Advocate’s offices in Northampton, MA. Presented in collaboration with Signature Sounds Recordings and NCTV. See more great artists at the Sessions home page right here (like the esteemed Ray Mason, as well as new groups like Eavesdrop Trio and Paper City Exile). The first two tunes, “Love Is All Around You” and “Save Me” will be included on Colorway’s next release (date TBA). Colorway In The Greenfield Recorder and Daily Hampshire Gazette! Well, we’re not even a week into 2017 and it seems like Colorway is making headlines in both Franklin and Hampshire Counties. There was a very nice story in the Greenfield Recorder on the Warwick Town Hall show that we’re playing on Saturday written by Sheryl Hunter. You can either read it here or I’ll include full text after the jump. Alex Johnson plays First Night in Northampton in Hampshire Life. He plays with Colorway. For complete video and photo gallery by Jerrey Roberts and Sarah Crosby, check back later tonight at http://www.gazettenet.com/Keyword?keyword=HAMPSHIRE%20LIFE. You can see a longer video with some clips for several of the performers during this amazing day-long event here. Many thanks to the Daily Hampshire Gazette for always supporting local, independent musicians. During the winter months, the music scene has a tendency to slow down, but fortunately we live in such a musically rich area, there are still plenty of options out there. One of these in the winter music series, presented by Wooden Fender, an offshoot of the Warwick Arts Council, is held at the Warwick Town Hall. The kick-off will be with Colorway performing Saturday, Jan 7, at 6 p.m., with a souper supper dinner and concert. Wooden Fender began to meet in late summer 2005 in an effort to benefit the Jeff Wallace Library Music Fund. That fall, it adopted the name Wooden Fender and in January 2006 hosted its first musical performance, Dr. G’s Good Medicine Band. They have presented shows featuring all types of music, including R&B, blues, jazz, rock and even classical. Artists like Trailer Park, Charles Neville and the Skeletons Big Band are a few of the acts that have been part of this winter music series. Colorway, a pop-rock group from Northampton, is looking forward to kicking off the series’ 2017 season by bringing their melodic, guitar-heavy tunes to Warwick. The past year was a good one for the band, which wrapped up the year by playing two shows at the Parlor Room in Northampton as part of Northampton’s First Night celebration. The packed standing-room-only shows saw people bopping in their seats and loudly clapping every time guitarist Alex Johnson delivered one of his trademark guitar solos. The group led by Johnson, who is also the band’s vocalist and songwriter, spent the early part of 2016 settling in with its new lineup of Riley Godleski on drums and Matt Clegg on bass (replacing original members J.J. O’Connell, the drummer, and bassist Dave Hayes.) But as the year progressed so did the band, and they went on to open sold- out shows for Foreigner, The Yardbirds, Ian Hunter and Richard Lloyd, who called the band, “amazing and inspiring,” in addition to playing their own headlining shows throughout the Northeast. Remember to arrive early to Warwick Town Hall, Warwick Common on Route 78,, because all of these shows offer a supper before the show. For this event, The Warwick Arts Council will serve homemade soups, chili, breads and desserts, which will begin at 6 p.m. The cost of the meal is $5 for adults and $3 for children. Then, head upstairs at 7 p.m. for a night of dancing to the tunes of Colorway. There is a suggested donation of $5 for the music portion of the evening — that will help pay for the band and support Wooden Fender’s ongoing goal of presenting live music in Warwick. You can also catch Colorway on Sunday, Jan. 22, at the Iron Horse Music Hall in Northampton. They will be opening for British guitarist Davy Knowles.